The Delhi Press Group - a publication house, has re-launched once again the magazine - The Caravan. It is a monthly journal of politics and culture. The price of the magazine has been increased from Rs 35 to Rs 40. The Caravan was first launched in year 1939 by Vishwa Nath, and it was the first magazine of the Delhi Press Group. The publication of the magazine was stopped in the 1980s. It got re-launched again in October 2008, worth Rs 35. The managing director (MD), The Caravan, Anant Nath commented on the launch of the magazine and said, "The Caravan is the oldest and the first magazine of the Delhi Press Group. We are pleased to re-launch this magazine, which had been very popular earlier as well. The language of the magazine is very liberal with a narrative style of writing and it is being launched in the market with a new design, shape and editorial content." 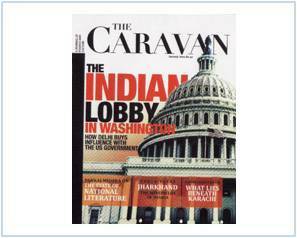 The Caravan in January issue will feature the cover story on - the India lobby in the US. A long-time South Asia correspondent in Delhi and now a contributing editor with The Caravan, Miranda Kennedy is investigating how the Indian-American community flexes political muscles in Washington DC. Some of the leading magazines being published by Delhi Press include - Grihshobha, Woman's Era, Saras Salil, Sarita, and Champak, among others. Its Tiger impact on Sponsors too!